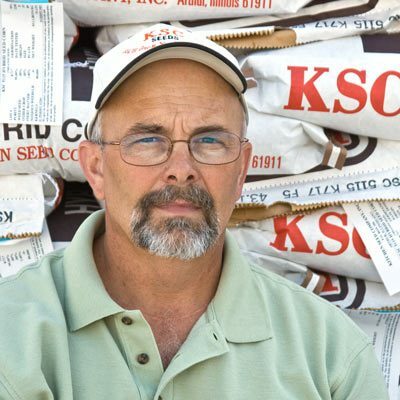 Duane Hopkins | Kitchen Seed Company Inc.
Duane began in sales for Kitchen Seed Co., Inc. in 1997 and has expanded his sales territory to cover almost all of Central Illinois. His duties, as Corporate Sales Manager, include assisting the entire sales staff in day-to-day operations and crop planning for all areas of agriculture, including grain, forage and wildlife. He is a 1979 graduate of Lakeland Community College with an associate degree. He has many years of farm experience, both in livestock and grain production. His expertise lies in the wildlife forage blends and he works hand in hand with Real World Wildlife Seed to study and develop foodplot blends. However, he is very knowledgeable in all the crops Kitchen Seed Co. sells and produces. Duane and his wife, Connie, reside in Arthur, IL where they both were born and raised. He is active with the local volunteer fire department and enjoys hunting and being outdoors.